A full Hall was a welcome setting for the annual Arrane son Mannin new song competition when three groups performed their new songs in Manx for prize money of Â£300 sponsored by Culture Vannin. There was a Manx concert either side of this highlight, with an excellent range of local talent. Triskellion (or 3/4 of it as illness had struck) featured Owen Williams (composer) with Lukas Hayhurst and singer Sarah James. Aerin Roberts would have been the second singer, but bronchitis had stolen her voice. Owen's song was Arrane ny Deiney G'obbraghâ - Song of the Working Men and was written in Manx as Owen is already a fluent young Manx speaker and talented musician. Jedoonee Bagoon came next with James Franklin and Cori Phillips performing their haunting Billey Euar ny Greg - The Juniper Tree, a song inspired by a dark fairytale of the Brothers Grimm. Biskee Brisht followed, a five piece band with composer, vocalist and ukelele player Ruby Biscoe-Taylor, David Kinley, Matt Brewster, Django Kinley and John Kaighin. Their song was Dty Skeealyn - Your Stories with a storyline of a family's discovery of their Manx heritage and folklore. Adjudicators David Kilgallon, Laura Rowles (a former Pan-Celtic new song writer and winner), and Peter Crellin had the usual difficult task of deciding on a winner: their choice was Biskee Brisht who will travel to Letterkenny in Ireland in Easter week to compete against new songs from the other five Celtic countries. The concert featured many fine Manx musicians and singers, in several ages and guises, from young cousins Josh and Ealish dancing, to grandmother Clare with Cliogaree Twoaie Gaelic choir which Clare has led for many years. Sons John and David also performed in a couple of diverse roles. Matt Kelly gave his guitar and vocal performance to an enthusiastic audience, as did talented sisters Katie and Kirsty Lawrence with fiddle, piano, cello, low whistle and vocals. Young band Scran, down to only four members together with their mentor Paul Rogers, also produced some excellent traditional music. Biskee Brisht performed too, including last yearâs winning Arrane son Mannin song, Nagh Abbyr Smoo which earned well- deserved applause and sent everyone off home humming the tune. 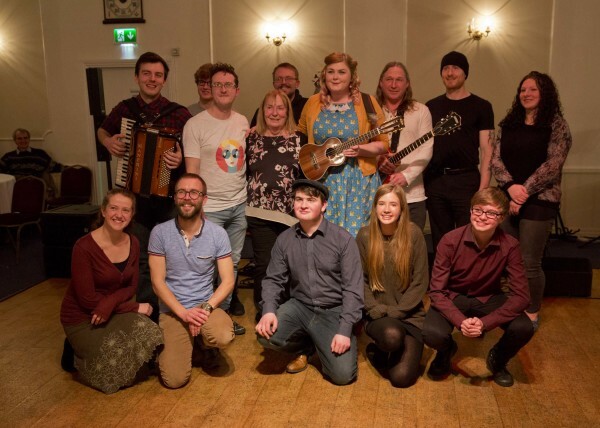 All participants once more gave of their time and talent free of charge and deserve much thanks for their continuing generous support of Arrane son Mannin and their promotion of new Manx music, song and dance. Many thanks also go to Culture Vannin for its support and work in promoting Manx language, music, song and dance and the wider Manx cultural tradition.